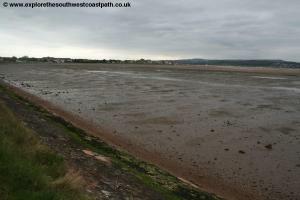 Although not part of the South West Coast path itself, the new Exe Estuary trail provides a good quality walking route on both sides of the Exe estuary up to Exeter and back. 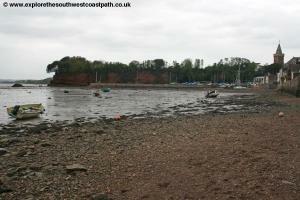 This walk covers the east side of the coast from Exeter to Exmouth via Topsham. 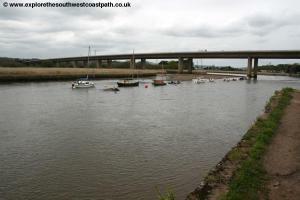 From Exeter the walk heads alongside the river through parks and pleasant suburbs to the Countess Wear bridge, the lowest crossing of the Exe it is possible to make on foot. 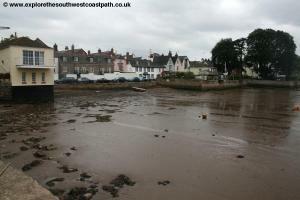 From here we pass through the pretty village of Topsham, cross the river Clyst and continue to the village of Lympstone. 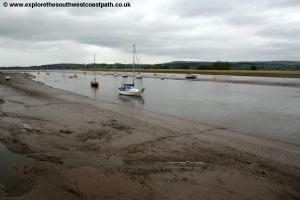 From here the rest of the walk is beside the tidal estuary to reach the coast and coast path at Exmouth. The walk begins from Exeter St Davids railway station, as this is convenient for the journey back from Exmouth and is right beside the river but you may prefer to start from the city centre, directions are provided from both start points below. For Exeter St Davids station, exit the M5 motorway at junction 31 onto the A30 west bound. At the first exit, take the A377 and follow the signs for the city centre. On reaching the busy Exe bridges junction take the 3rd exit still on the A377, signed for St Davids station and Crediton and Barnstaple. Soon after passing under the railway line on a viaduct take the left turn to the station, which has a large pay and display car park. If you prefer to start the walk from the city centre, exit the M5 at junction 30 and take the A379 and remain on the A379 at the complex first junction. When you come to a roundabout turn right onto the A3015 and follow this to the centre. Park at the Cathedral and Quay car park, which is the main visitor car park and well signed. Be aware that the roads into Exeter can be quite congested. As a cheaper and often quicker route there are park and ride sites just off junction 29 on the A3015 (Honiton Road Park and Ride) and at junction 30 (Sowton Park and Ride). Both coast the same and the buses take you to the High Street. Exeter is well served by public transport. If you are starting the walk from Exeter St Davids station there are excellent train services. There are long-distance services from London Paddington to Exeter via Reading, Taunton and Tiverton Parkway, from the Midlands, North and Scotland via Birmingham, Cheltenham, Bristol and Taunton, services from London Waterloo via Woking, Basingstoke, Andover, Salisbury, Gillingham, Yeovil, Axminster and Honiton and from Penzance via Truro, St Austell, Plymouth and Newton Abbot, as well as many smaller stations on most of these routes. These longer distance services generally run roughly hourly. In addition there are broadly hourly trains from Barnstaple to Exeter via Eggesford and Crediton and from Paignton via Torquay, Newton Abbot, Teignmouth and Dawlish. 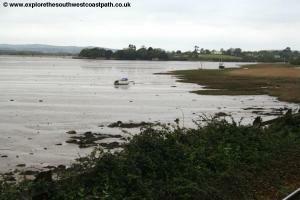 From Exmouth trains generally twice per hour via Lympstone and Topsham. All these services also operate on Sundays, but typically at a reduced frequency. Cross Country Trains operate services from Scotland, The North and The Midlands to Exeter via Bristol and also to and from Plymouth and Penzance. South West Trains run the services from London Waterloo to Exeter and Great Western Railway run the remainder of the local services and longer distance services from and to London Paddington and from and to Plymouth and Penzance. The trains from London Waterloo and Exmouth also stop at Exeter Central station in the city centre, as do many of the services from Barnstaple and Paington if you prefer to start from the city centre. 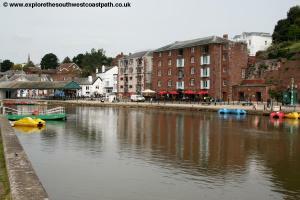 As well as a good train service Exeter also has a good bus service with connections to local towns and cities including Exmouth, Budleigh Salterton, Sidmouth, Dawlish, Torquay, Paignton, Plymouth, Lyme Regis, Bridport, Weymouth, Tiverton, Cullompton, Okehampton and Bude. 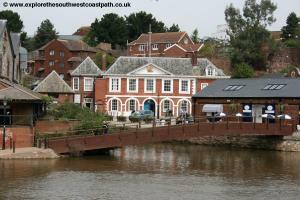 Exeter is a major city and as such has a large choice of small and large hotels and many bed and breakfast. The visitor information centre is in the quay (which is passed on the walk) and can provide help with accommodation. 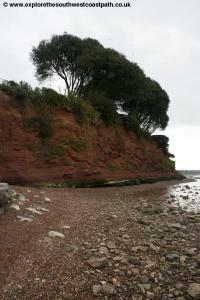 Heart of Devon Tourism has a search facility for Hotels in Exeter. Being a city, there is less in the way of self catering accommodation, but the recently-opened Crealy Meadows Campsite is the closest to the city centre but they do have a minimum stay of at least two nights. 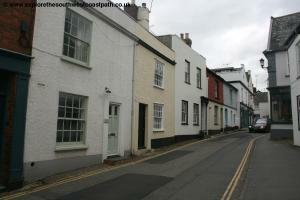 If you prefer, Exmouth also has a good range of accommodation. 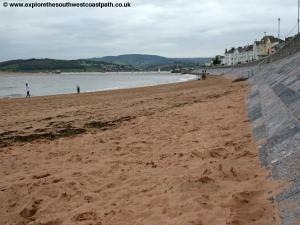 Heart of Devon Tourism provides a directory of hotels in Exmouth. If you are beginning this walk from Exeter St Davids station, from the main station exit turn left, with the station to your left. Take the first road on the left, the access road to the station yard car park. Do not turn left into the car park but keep going on the path ahead and on reaching the road beyond turn left, taking great care as the road lacks a pavement and is busy. Ahead you have the level crossing. Cross the crossing via the pedestrian gates following the instructions from the attendant if present (which is normally the case). Once over, cross the road with care, as there is a pavement on the right hand side. Soon you cross the River Exe on a bridge and beyond this you immediately come to a second bridge, this time over a man-made flood channel of the river. Once over this and just before a car park on the left take the signed foot and cycle path off to the left. This very soon splits and you take the lower path, which goes right beside this flood channel although on occasion after very heavy rain this can flood. If this occurs there is a higher level path initially parallel and at the top of the bank (when the surfaced part turns off, keep on the grassy path beside the river). Soon you pass under the railway line to Paignton and Plymouth. Soon after this, the lower level path rises up to a bridge over this flood channel, where it joins the main channel of the river at a weir, with the Mill on the Exe pub visible just beyond the weir on the left. Here keep ahead on the path that soon drops down to the river level again, now with the river on your left (rather than the flood channel). Follow this under the two roads of the complex Exe-bridges. Just beyond these bridges you pass the Malt House pub on the left, made out of the traditional red stone of the area (the red colour is due to the high iron-content of the soil here). 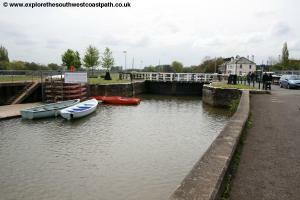 Keep on the lower level path to reach the quay area. A wooden footbridge crosses on the left if you wish to explore the lovely quay area where there is the old custom house, numerous restaurants and bars and craft shops and the visitor information centre. You can cross back on this wooden bridge or the cable-pulled ferry just a little further up (for a small charge). Skip the next paragraph if you start from St Davids. If you are coming from the city centre from the High Street and at the junction with Queen Street on the right, turn left on the footpath to the cathedral. Walk right past the front of the beautiful cathedral with the entrance on your left and continue straight ahead as the path becomes a road with a red-brick wall on the right. At the junction at the end, turn left with Exeter Cathedral School on the right. Follow this road (Bear Road, soon Palace Gate) to it's end at a T-junction. At the road ahead, cross via the pedestrian crossing just to the right and once across turn left alongside this road. Just past an unusual church on the left hand side, turn right and take the path beside the remains of the city wall on the right. Take the path ahead that goes on a footbridge over the A3015 and follow the path ahead beside the Cathedral and Quay car park. 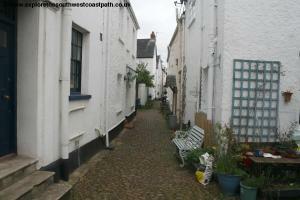 Then take the footpath off to the left that leads down hill to the cobbled street which leads down to the quay itself by the river. On reaching the quay and the river itself you can either cross the river via the Butts Ferry a little ahead (for a small charge) or turn right going through the shelter and cross the two little footbridges ahead to cross the river. Whichever start point you choose you should now be on the south side of the river. Turn left with the river on your left and flats to your right. Pass a green and open area on the right and continue straight ahead with the former Maritime Museum to your right, which closed in 1997. Keep ahead here until you reach the lock that marks the entrance of the Exeter Ship Canal, a navigable route for boats here to the coast (the river itself has weirs, which prevent boats using the main river channel). Here cross the bridge behind the first lock gate and take the path with the canal on your right and another flood channel of the river on your left. Shortly the path ahead rises to a bridge and you turn left on this path over the end of the flood channel to your left and once beyond briefly to the right and then left again on a suspension bridge over the main river, to end up on the east side of the river. Once over turn right through the metal gate into Belle Isle Park on the right and follow the riverside path through this pleasant park. At the end of the park leave via the gate at the other end and continue on the rather grotty path with fences on either side. This brings you out into a residential road and you cross and take Salmon Pool Lane slightly to the left going up hill (signed for River and Playing Field). 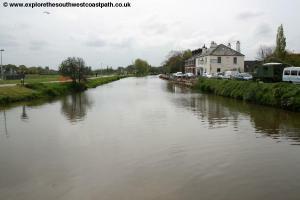 At the end of this road, turn right on a footbridge back over a channel of the river, with a weir to your right. As soon as you are across the bridge, turn left along the gravel track with the river on your left, which has split into two, making the land we are on an island, Dukes Meadow, used by the university. Continue on this path through a small area of woodland and down to Mill Lane. Follow this road down to a T-junction with Mill Road and turn right along Mill Road. Continue past a private car park on the right as the road becomes very narrow. At the end of this road (also a footpath) turn right along Countess Weir Road. 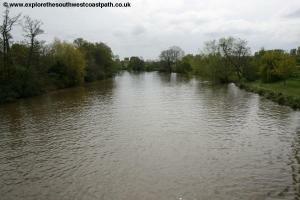 This soon climbs offering some lovely views of the river below, as the two channels around Dukes Meadow re-join. Pass the Youth Hostel on the left and continue past another lovely old building on the left (The Old Barn). Follow this road as it soon descends again and comes to the main road leading to the Countess Weir bridge. Cross this road via the pedestrian crossing to the left. Once over turn right and then take the first road on the left, Glasshouse Lane. As the road turns to the left, take the road off to the right (also Glasshouse Lane) as it undulates on a route beside the river. As it descends down towards a thatched cottage ahead and turns left, take the signed footpath on the right beside the thatched cottage. Follow this path past a couple of houses on the left and these soon end, with a tarmac path ahead and a field to the left. 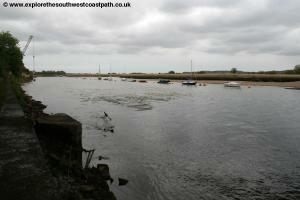 A sign warns that the path is incomplete to Topsham and is not passable at High Tide. The path is in fact complete but as the sign warns, it does flood at high tide so an alternative route along the road will be needed here if that is the case. Soon the tarmac path descends down to a junction of paths with a path off to the left uphill (an alternative route to the road, if the river is flooded over the path ahead). 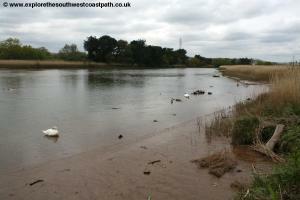 Now take the path ahead that goes through reed beds beside the river which is the area flooded at high tides, on a mainly gravel path. 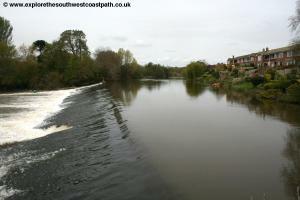 The reedy area soon ends and you continue on the path right beside the river to pass under the M5 motorway. 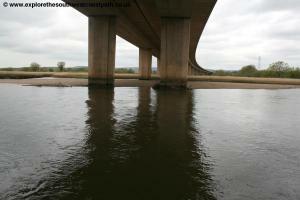 The river has now widened to an estuary and you pass under the M5 on the often wet path beside the river. 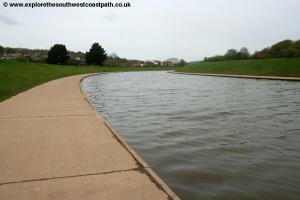 Just after the M5, this becomes a concrete path that passes a boat yard on the left. 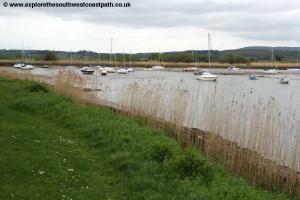 The river here is particularly attractive, with a series of creeks on the right forming the Exe Reed Nature Reserve. Continue on this path as it passes along the back of some gardens on the left and then emerges into a pleasant park, with seats overlooking the river. At the south end of this park turn left until you reach the road and then turn right along the road, Ferry Road, past some modern flats. 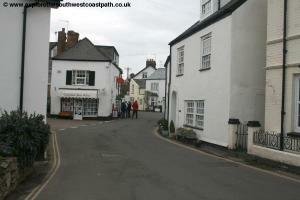 Soon you come to a junction with Follet Road, as the houses become much older and we enter the pretty riverside town of Topsham. Continue ahead on the narrow road, Ferry Road soon coming to the Passage House Inn. At the junction ahead continue straight on along the road signed as a dead-end (ignoring the sign for vehicles to turn left ahead). This soon becomes pedestrianised ahead with the river to your right and seats on your left Keep ahead still along Ferry Road until you come to the main quay where there is a car park. Buses also run from here back to Exeter on route T.
Continue ahead along the road with the quay to the right along the Strand. 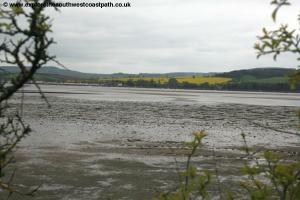 Continue along Strand with regular views of the wide river to the right. When the road turns sharply to the left, away from the river keep ahead on the slipway and then the surfaced path beside the river. When this path becomes the road again and you turn left and head north along the road passing some houses on the right. Soon you have the entrance to the Bowling Green RSPB reserve on the right. 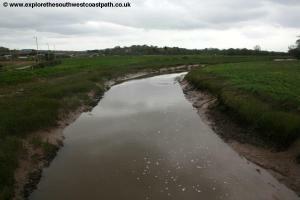 You can take this down to a bird hide on the corner of the Exe and Clyst estuaries (although the path is a dead-end). 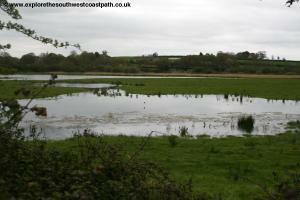 Continue along the road with the nature reserve on the right until you come to the railway line ahead. A footpath goes up over the tracks, but ignore this and instead turn left with the road, parallel to the line. 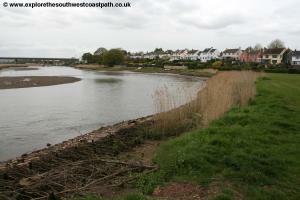 Note that the council plans to build a new crossing of the River Clyst for this footpath and when I walked this area, planning permission notices have been erected. Until this is in place the route continues as described below. The road soon rises and crosses the railway on a bridge. Continue along this road until you come to a T-junction at the end on the main road. Turn right here soon passing the pink Bridge Inn on the left. 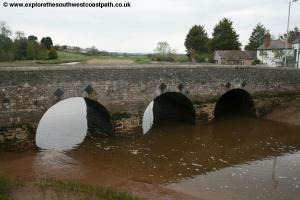 As you approach the bridge over the River Clyst, take the pedestrian and cycle bridge that has been newly constructed to the right of the original stone bridge (which lacks pavements) giving the benefit of both a safe route and good views of the road bridge. Once over continue on the pavement (a shared cycle path). Keep to the road as it turns right after the bridge and soon back to the left again. Ignore a track into a business park on the right and keep to the main road ahead as it turns fairly sharply to the right. Just before you reach buildings on the right turn right along the well signed cycle and footpath, with fences on the left. This passes the industrial buildings to the left and soon comes to some houses where you keep straight on. When this comes a to a T-junction turn right (ignoring the footpath signed to the left) on what is now a new route (and so not marked on many maps). 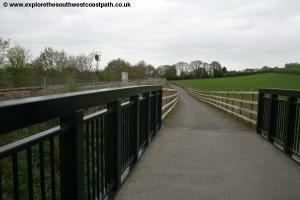 You now follow the good quality tarmac path close by the river Clyst until you reach the railway ahead. Here you turn left on the new path adjacent to the railway line. You now continue south along this until we reach the first houses of Exton, where the path turns left to run along a track with houses on the right. On reaching a junction, turn right, following Green Lane, a residential road. Keep ahead as you pass Exton Lane on the left, and the road ahead now also becomes Exton Lane. At the end of Exton Lane you reach Station Road and turn right, soon passing the Puffing Billy pub on the right. Just before the end of the road (where you reach Exton station), turn left on the new cycle path on a bridge and then a boardwalk that runs over the marshy area ahead with the railway line on the right and the estuary beyond. 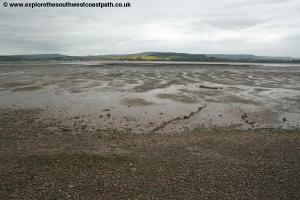 Soon the path becomes a road through the Lympstone Commando Training centre for the Royal Marines (CTCRM). You are now between the high fences of this establishment on the left and the railway on the right and soon pass Lympstone Commando station. This station is one of a small number of private railway stations which in this case is only for the user of visitors to the CTCRM and it is not permitted for the public to use it. There is also a guard in the box guarding entry to the site on the left. Continue straight ahead until the site ends and you continue on the surfaced track beside the river and with the grounds of Nutwell Park to the left. 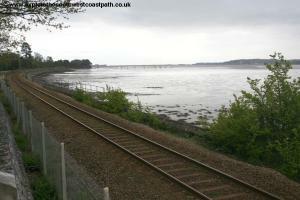 Soon the path approaches Lympstone and you take the wide path that crosses the bridge over the railway line (or you can continue a few metres ahead for Lympstone Village station). Cross the railway into a pleasant grassy area where you turn left and keep the railway line close by on the left. 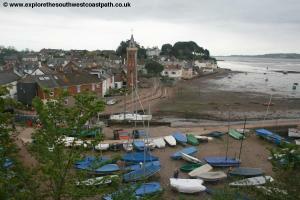 At the south edge of this, you have wonderful views over the town of Lympstone. At the far south east corner of the field you continue on the minor road that then heads down hill. This comes to a track going left to right and to the right down to the little harbour area. Cross the bridge over the little stream leading to this little harbour and take the track behind the houses that soon becomes a road and comes out next to the post office of Lympstone. Turn right here with the river to your right and ignore the couple of tempting footpaths off to the right (they are all dead ends, leading to the estuary). 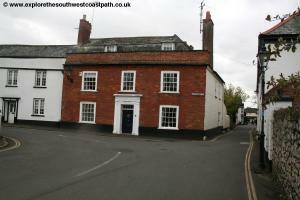 Continue past the Globe Inn and when the road turns to the left (with a little cobbled pavement between houses ahead), turn left with the road. Continue on this road as it heads up hill with a few turns on the way and ignore roads off to the left. Continue on this road as it heads down hill back to the estuary, with some seats on the right. 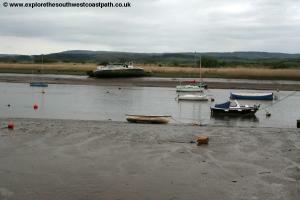 Follow this road round to the left, again away from the estuary and ignoring the slipway ahead. Just before the road goes under the railway bridge turn right on the signed footpath, a rather narrow path that runs alongside the railway on your left. Soon this narrows and you are now right on the estuary, between the water and the railway (note that there is the continuation of the cycle path on the other side of the railway if you prefer, which can be reached by turning right just under the railway bridge instead).Soon this comes to a wider grassy area next to the railway line where you follow the grassy path along the estuary. 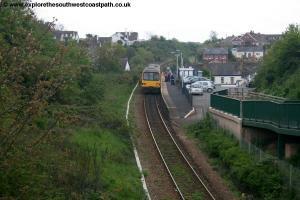 At the end of this grassy area you take the footpath that crosses the railway line. Be sure to check for trains coming in either direction before crossing. 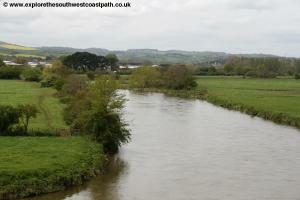 Once over, turn right along the new cycle path (which is also part of the East Devon Way). This soon comes out to a residential road where you go straight ahead, with the river to your right. 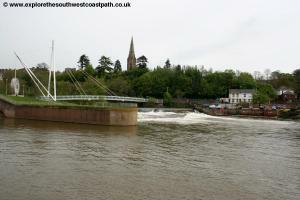 You pass Exebank on the left and continue with a little stream along a man-made channel to the right. Keep with the road as it turns to the right ahead to cross this stream and then turns left, and just after this, follow the signed footpath into a park to the right. When the path splits, take the right split to climb up and cross the railway line, again checking for trains first. Once over, turn left and follow the main path that soon passes a boat yard on the left with the river on your right and soon coming out to the estuary car park. 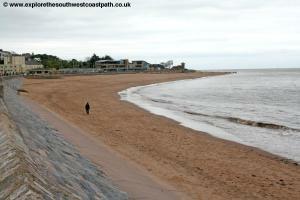 Keep along the edge of the car park and continue passing Exmouth station and the bus station on the left. Follow this road as it turns to the left, passing another car park on the left. At the roundabout ahead turn right along Langerwehe Way, with the recreation ground on the right. As the light industry on the left ends continue ahead into a new area of housing, with a car park on the right. Then turn left (with the road) along Shelly Reach, an area of new housing. Ignore Harbour Court on the left and keep straight ahead and on reaching Regatta Court on the left, turn left through the car park and ahead to reach the harbour. Follow the path along the edge of the harbour straight ahead and at the other end it comes out to another small car park and road. Keep ahead here passing the Beach Pub on the left and go straight ahead to reach the sea and the South West Coast Path. Turn left along the sea front with the beach on your right. As you pass a large hotel on the left and then come to a large junction, with a grassy area on the left, turn left along and go straight ahead along Alexandra Terrace initially with a grassy area on the right. Take the first left into Imperial Road with the park on the right. When the park ends keep straight ahead to return to the large roundabout. Cross with care and re-trace your steps to the bus and railway station, where the walk ends. Exmouth station has trains every 30 minutes or so Monday – Saturday back to Exeter, serving both Exeter Central and Exeter St Davids stations. 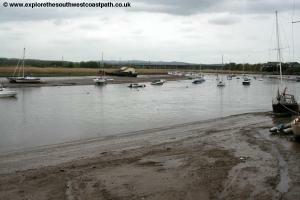 From Exeter trains generally continue to either Barnstaple or Exmouth. On Sundays the trains run hourly. The journey back to Exeter takes around 25 minutes. 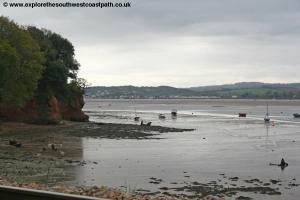 All trains to and from Exmouth are operated by Great Western Railway. If you prefer to return by bus, Stagecoach South West bus service 57 runs 4 times an hour Monday – Saturday back to Exeter Bus station in the city centre. This goes from Exmouth parade in the town centre, rather than the bus station. On Sundays this bus runs twice per hour. The journey takes a little over 35 minutes by bus. 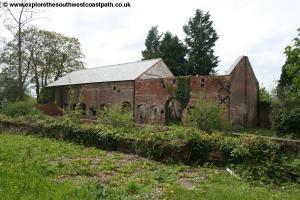 This route of this walk is split over 3 maps, explorer maps 110, 114 and 115. These are available from bookshops and online retailers nationwide. 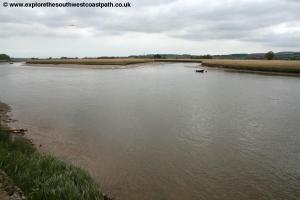 However to save cost a custom map can be made on the Ordnance Survey website showing the whole walk on one maps. This currently costs £16.99, normally yes than buying the three maps.